Attention is not just receptive, but actively creative of the world we inhabit. 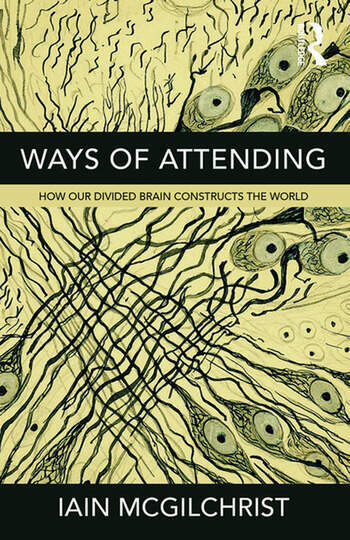 How we attend makes all the difference to the world we experience. And nowadays in the West we generally attend in a rather unusual way: governed by the narrowly focussed, target-driven left hemisphere of the brain. Forget everything you thought you knew about the difference between the hemispheres, because it will be largely wrong. It is not what each hemisphere does – they are both involved in everything – but how it does it, that matters. And the prime difference between the brain hemispheres is the manner in which they attend. For reasons of survival we need one hemisphere (in humans and many animals, the left) to pay narrow attention to detail, to grab hold of things we need, while the other, the right, keeps an eye out for everything else. The result is that one hemisphere is good at utilising the world, the other better at understanding it. Absent, present, detached, engaged, alienated, empathic, broad or narrow, sustained or piecemeal, attention has the power to alter whatever it meets. The play of attention can both create and destroy, but it never leaves its object unchanged. How you attend to something – or don’t attend to it – matters a very great deal. This book helps you to see what it is you may have been trained by our very unusual culture not to see. Dr Iain McGilchrist is a Quondam Fellow of All Souls College, Oxford, a Fellow of the Royal College of Psychiatrists, a Fellow of the Royal Society of Arts, and former Consultant Psychiatrist and Clinical Director at the Bethlem Royal & Maudsley Hospital, London. He was a Research Fellow in neuroimaging at Johns Hopkins Hospital, Baltimore, and a Fellow of the Institute of Advanced Studies in Stellenbosch. He has published original articles and research papers in a wide range of publications on topics in literature, medicine and psychiatry. He is the author of Against Criticism (Faber 1982), The Master and his Emissary: The Divided Brain and the Making of the Western World (Yale 2009), The Divided Brain and the Search for Meaning: Why Are We So Unhappy? (e-book short) and is currently working on a book of epistemology and metaphysics entitled There Are No Things, to be published by Penguin Press.